IMBOLC is the festival that attunes us to the coming spring – it is the time of promise, potential and transformation of what no longer serves us. It is the moment to poke our noses out from our winter slumber and allow the powers of our imagination and intuition to bubble up, revealing to us new visions of what we can manifest in our lives and for the world. At winter solstice we lit candles to assure ourselves that, although currently at the darkest point of the annual cycle, the light would return. Now at Imbolc we look inside to see what that light is bringing to us and light more candles to illuminate our way out of darkness, and prepare ourselves inwardly for the changes coming our way. Imbolc is about emerging from the inner realms, from the inward, earth time of winter, revitalised, potent and fertile with potential. It is about reclaiming what has been forgotten and invoking the life force to make us strong, to empower us and our visions for the year ahead. In 2014 new moon in Aquarius and calendar Imbolc fall together – adding to the acceleration of consciousness that was highlighted by new moon and new year coinciding. At calendar new year the world makes resolutions, sets intentions – which will have extra impact this year due to the new moon happening at the same time. The Imbolc new moon on 30th January now doubly enhances this energy, and gives us the opportunity to attune ourselves to the rising wave of conscious evolution. Perhaps we have old outdated beliefs, habits, fears that will not serve us during this time of planetary transformation and growth. 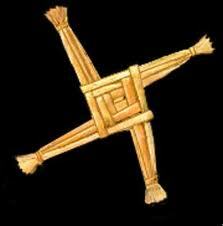 At Imbolc these can be ritually released, burnt away in the candle flames, or in a ritual fire. This is a time to cleanse, purify and renew. Visiting wells and springs can help this process enormously, for this is the festival of the Maiden Goddess, often known as Brigit (ancient Celtic deity associated with intuition, inspiration, divination; the preserver of tradition through poetry and song), to whom they are sacred. This is time to share the visions rising from our subconscious in music and verse, to bring out the tarot cards and other forms of divination, and allow the returning feminine energy to lead us, allowing the forceful rational mind to take a back seat so that our intuition and imagination can blossom, as the trees and spring bulbs are starting to do. Here we can see why it was worthwhile to surrender to winter, to accept the dark journey of the past weeks, for we are already at the time of promise, when spring comes into sight and we can emerge with new energy, new ideas, new strengths from our inner time. The deeper we can go into our ‘darkness’, our ‘stuff’ during winter, the higher we will fly when the warm seasons return. Having accepted winter there is now much to gain from looking forward to spring. It is time to plant new ideas and leave them to germinate during the last phase of the winter. Time to bring forth inner visions and understanding, expressing them especially through poetry, art and crafts. Time to explore our links with the inner worlds of spirit through divination and clairvoyance. This is a time of initiation and healing – to go within to meditate and bring out our inspirations, go outside and feel the emerging life force, commune with the nature spirits, feel the spark of promise in the air. This year Venus goes direct at imbolc, bringing us a super sized shot of goddess energy after several weeks retrograde, and as it is new moon it is also Chinese new year, starting the fast moving, energizing year of the wood horse. Whether alone or with a group, all these energies can be harnessed in order to cleanse our energy bodies and transform old ideas and attitudes, giving birth to new ones that serve our health, and our growth as beings of light and spirit, better. Imbolc falls in the month of Aquarius, and comes to remind us all that it is time to come out of the darkness of ignorance and suffering – and enter a new and highly enjoyable world of enhanced being, enlightened relationships and service to awakening humanity. ← What is the future for gay spirituality?